TriMet’s online trip planner makes it easy to plan your trip to the All-Star events. This is the perfect opportunity to try our new TriMet Tickets mobile app. The free app lets you easily purchase and use tickets and passes instantly on your phone – anywhere, anytime. Learn more at trimet.org/mobiletickets. With many events including the big All-Star matchup lasting more than two hours, purchase a Day Pass. It’s the same cost of two 2-hr Tickets. MAX Blue and Red line trains will drop off/pick up fans across the street from Providence Park for the 2014 AT&T MLS All-Star Game on Wednesday, Aug. 6 and for the precursor Chipotle Homegrown Game on Monday, Aug. 4. Two regular service bus lines, Line 15-Belmont/NW 23rd and Line 20-Burnside/Stark, serve the stadium and are a good option for fans heading to and from the soccer showdowns. As we do for the Timbers games, TriMet will run express buses between downtown Portland and the stadium before and after the matches to connect to other bus lines, MAX Green and Yellow line trains and parking garages. 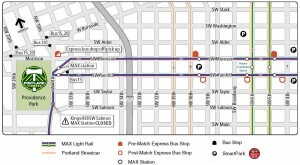 Catch express buses across from MAX stations at Mall/SW 5th Ave and Galleria/SW 10th Ave beginning about 90 minutes before a match. 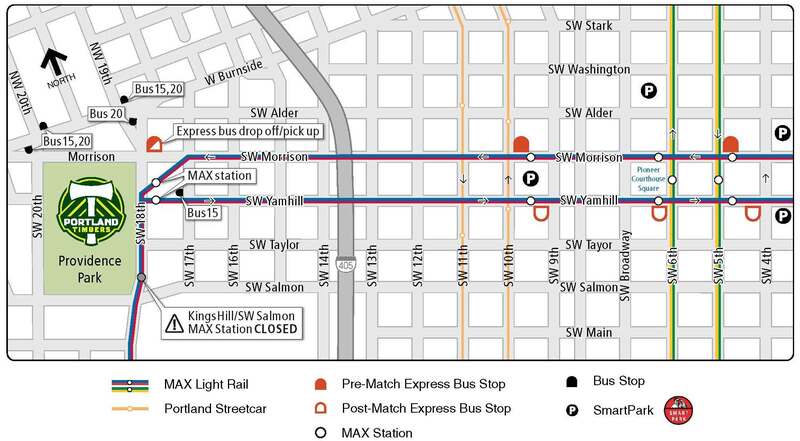 After the games, board express buses across from Providence Park’s main entrance on Morrison Street at 18th Avenue with drops offs at the Library/SW 9th Ave MAX Station, the Pioneer Square South MAX Station and the Mall/SW 4th Ave MAX Station. Extra MAX trains will be running following matches to help fans get on their way home. Remember to pay your fare. Standard fares are required on all MAX trains, buses and express buses. For safety reasons, the nearby Kings Hill/SW Salmon St MAX platform will be closed two hours before games. It will remain closed until an hour and a half after the matches or until the crowd clears. Pioneer Courthouse Square will be hopping too. An All-Star Game viewing party, complete with a big screen, will be held at the Square. All MAX lines serve the Square and dozens of bus lines stop nearby. Trains and buses will be crowded in the City Center, especially on Wednesday, so be patient and plan some extra time. We’ll keep trains and buses rolling until the crowds clear. With soccer fans in town from throughout the world, a sell-out crowd will be on hand as the Portland Thorns host the Houston Dash on Sunday, Aug. 3 at 7:00 p.m. at Providence Park. As with the MLS All-Star soccer matches, TriMet will run express buses and have extra MAX trains on hand. We want to remind riders and fans to stay safe while enjoying the festivities. Be vigilant and if you see something suspicious, say something to a TriMet employee, a police officer or by calling 9-1-1. Be aware, pay attention and use caution around our trains and buses. Be especially alert around TriMet vehicles and tracks outside Providence Park and Pioneer Courthouse Square Wednesday as crowds swell after the All-Star Game.